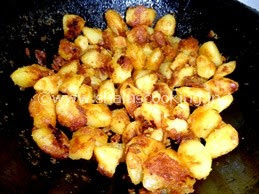 Easy Potato Roast - Urulaikizhangu Varuval, this is an easy, simple and delicious dish. This is one of the best lunch box option to pack with any variety rice. This roast does not require any fancy ingredient to cook, we are going to cook with the simple items that are available in our kitchen. My son love this potato roast very much. By the way, he likes any dish made out of potatoes ;) You can make this roast using baby potatoes also. I have made using regular potatoes here. Boiled Potato - 4 No. 1. 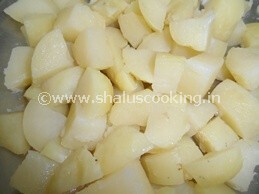 Boil the potatoes and cut them into medium size cubes. 2. 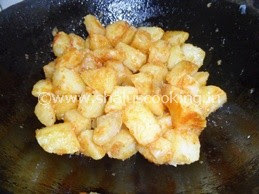 Heat oil in a kadai and add cubed potatoes. 3. Add turmeric powder, chili powder, garam masala and salt. 4. 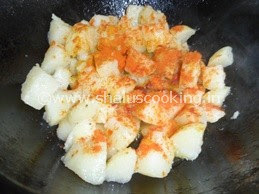 Mix it well to coat the spice powder on all sides of the potatoes. 5. Roast the potatoes on medium flame till the potatoes are roasted well on all sides. Switch off the flame. 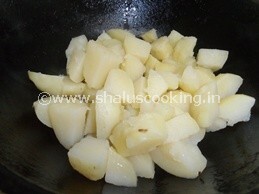 Easy Potato Roast - Urulaikizhangu Varuval is ready. Serve it with any rice varieties.